The former test cricket umpire Dickie Bird has given his backing to a campaign to change a Royal Mail address which leaves the name of his Yorkshire village. Mr Bird, who lives in Staincross, near Barnsley, in South Yorkshire, is supporting a ballot to change the address used on all the mail to his village. 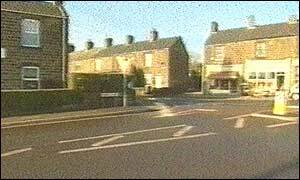 Residents of Staincross have had to include the name of another local village - Mapplewell - on their mail. The villagers have now decided enough is enough and they want the name of their own village to to used on the post. Mr Bird said: "I think for local people, what's important to them, is that they'd like to keep it Staincross because of the historical side of it. "Staincross is steeped in history, it's in the Domesday Book. "My cottage is 17th Century and John Wesley, the Methodist lay preacher, came though the village and slept in the room that I sleep in, so it's things like that I'd like to keep for Staincross." Ian Turner of Barnsley Council said: "This will amend the post code address file so that Staincross is reinstated for the properties that fall within the ancient boundaries."